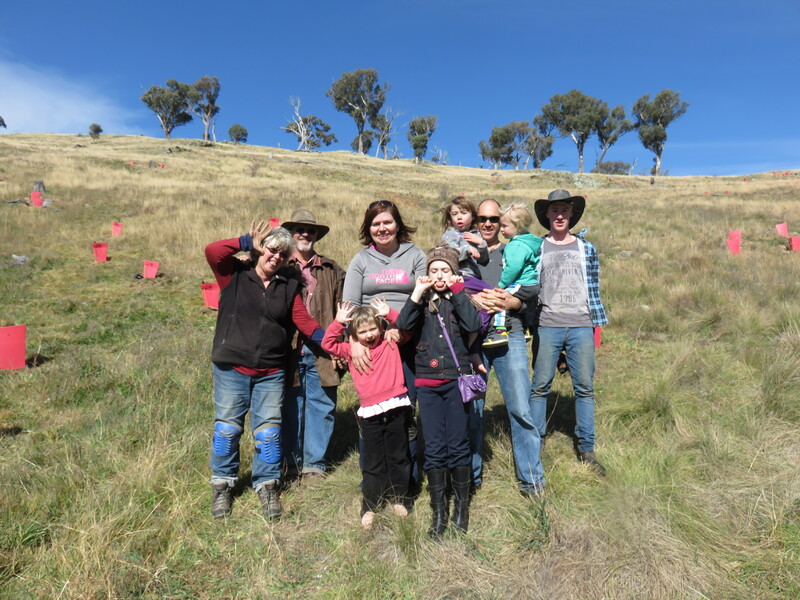 A late addition to the collection of trees we’ve been planting this year has been a group of trees that have just graduated from the Australian National University. They’re now decorating the slopes of our box-gum woodland plantation with tasteful stainless steel pendants and copper necklaces identifying them. The concept of the research (by Tricia Stewart, working with Justin Borevitz and Jason Bragg) is to look for guidance on choosing trees for landscape restoration. Just the thing we’re working on. When my Dad was planting trees in previous decades, there was very little variety available. 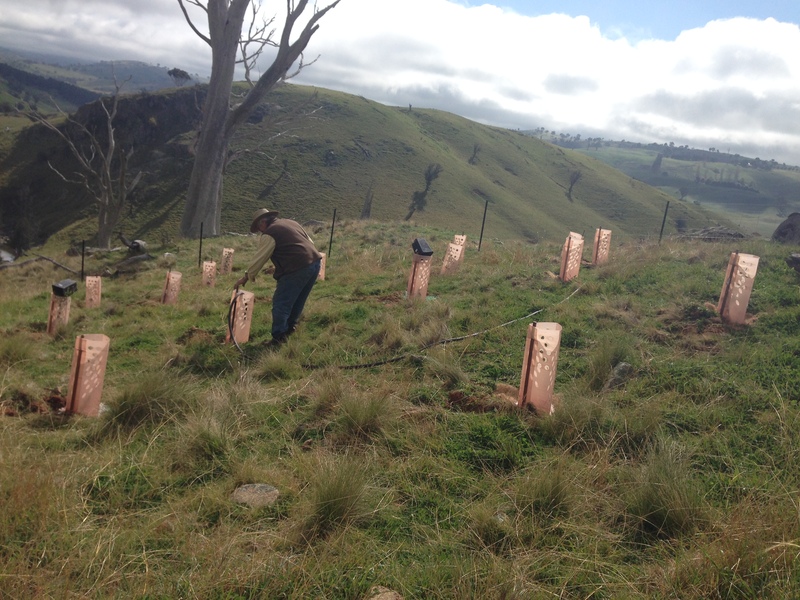 A lot of what we planted were “bluegums” which promptly had their leaves eaten off, or died from some other less obvious cause. That led him to switch to planting European poplars and willows which thrived and grew well, but struggled during the drought and are little benefit to our local wildlife. Some of the problems with growing the tubestock trees that were available in the 70s may have been due to the fact that they were often sourced from only a very few parent trees, and often those trees were from a long way away, with, for example, different levels of frost and heat tolerance. In the 1990s people became more aware that sourcing seeds locally would be more appropriate, and potentially more successful, so they started using only local seeds. But once again, the seeds may be coming from a very limited number of trees and the result may be that revegetated areas end up more genetically inbred than the woodlands they are supposed to be recreating. More recently, there have been recommendations to add seeds from trees further away, to help bring back the genetic diversity. That might help them withstand climate change, or just normal life in a paddock. But which trees? How far away is far enough? It’s a tricky issue. Tricia’s research compares how inbred small groups of isolated trees and large stands, and how much their genes vary across different climate zones and distances apart. That might help guide the choices people make about which trees to plant where. The Yellow Box (eucalyptus melliodora) that she’s studying are part of an endangered ecosystem that supports cool things like Squirrel Gliders, Regent Honeyeaters and Superb Parrots. That’s why Local Land Services gave us a grant to fence and revegetate 10 hectares. 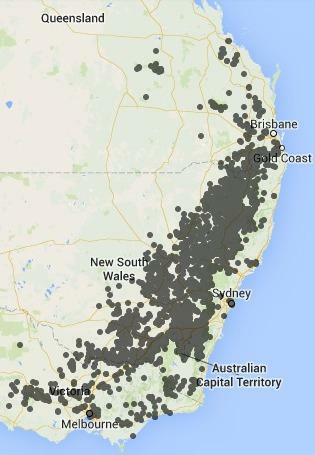 From the map Tricia gave me, it looks like there are lots of them, but box-gum grassy woodlands are particularly threatened because they occur in the same places that are best for grazing sheep. And sheep tend to eat off any naturally regenerating tree seedlings, plus they love to eat out many of the rare native grasses if they’re given the chance. Anyway, Tricia had lots of yellow box seedlings that she’d grown from different sets of seed, each one genetically identified and tracked. Craig suggested she might like to plant them out at Esdale. So we had a few lovely sunny planting days. Justin did a tricky thing with mapping all the trees we planted by gps and inserting photos – which you can see at this link. After some discussion, we planted three trees from each of Tricia’s three groups, nine altogether, plus an equal number of shrubs to keep them company. That way they could be compared. We planned to do two more plots on different aspects of the hillside, but had to leave that for a different day. It turned out, however, that the trees that Tricia and Jason had raised had been coddled all their lives. These pampered princesses even had lovely classical music played to them to help them grow quickly in their hothouse. Jason says “Vivaldi’s better. Chopin just makes them nervous.” Hm. 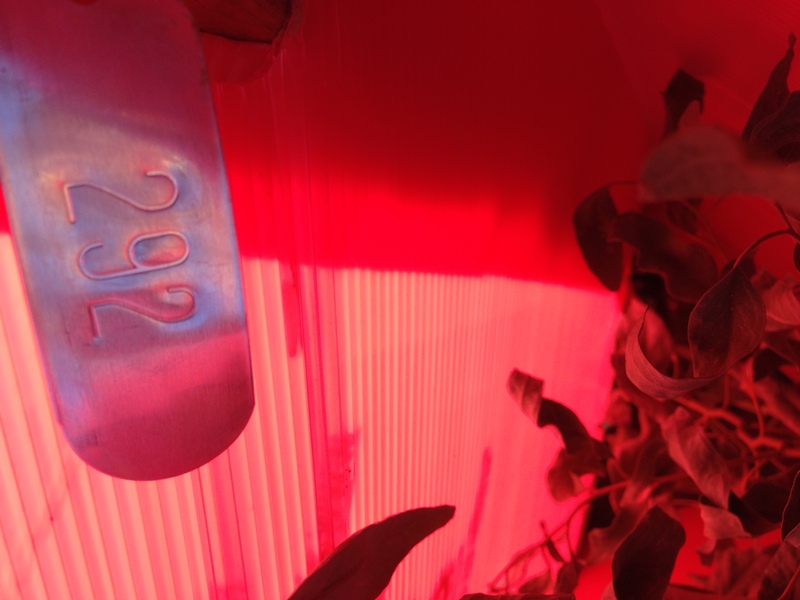 The idea was to produce leaves that could be analysed for their DNA, the seedlings were really just a side-effect. The result was that the first nine we planted were not very happy to be suddenly dumped on a rocky hillside on the coldest series of nights we’ve had this year. Even the guards and mulch mats were no protection against eight degrees of frost. I felt a bit stupid that I hadn’t checked how well they were hardened off before planting. Dealing with these setbacks is part and parcel of trying things out. I prefer it when everything works perfectly, though. I looked up what information I could about why these particular trees were having trouble with frost. 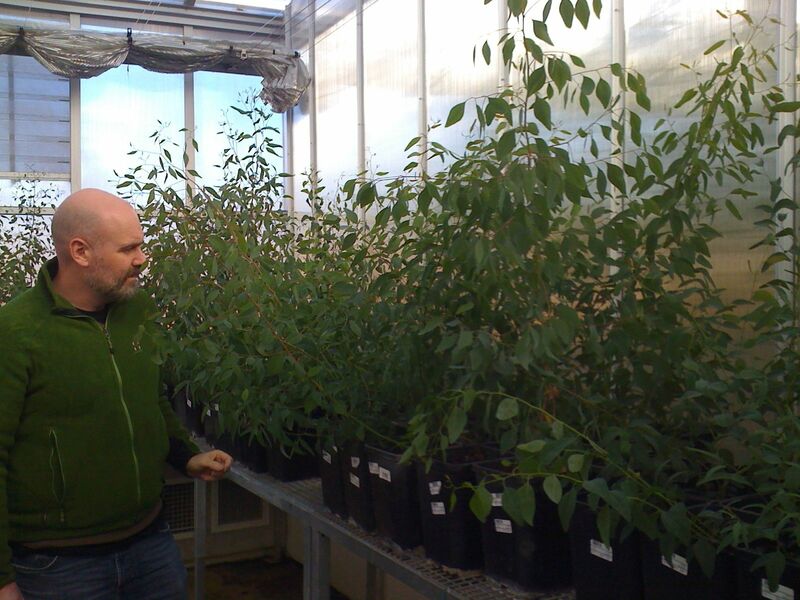 Besides needing to be acclimatized before planting, it turns out that eucalypts are particularly irritated if you try to plant them out when they’ve grown too large. 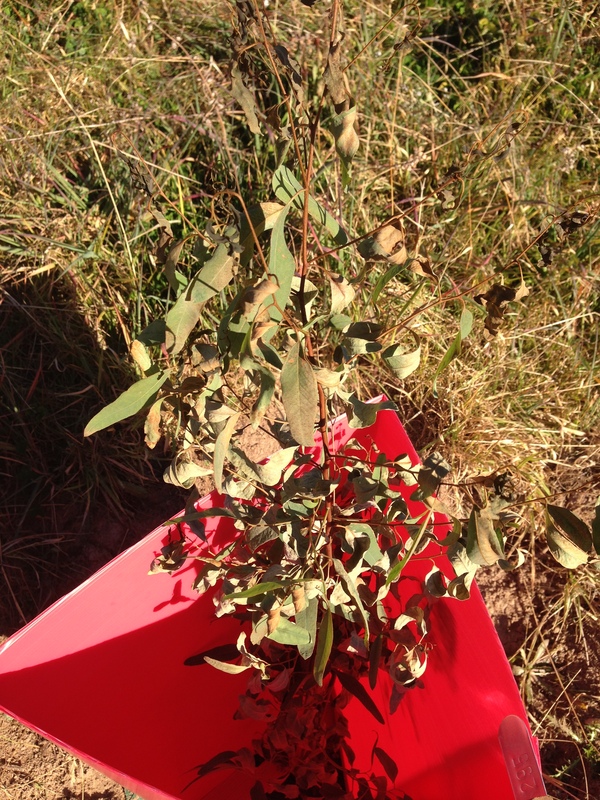 I found The Hardy Eucalyptus Page which had information about growing eucalypts in England, which suggested trimming back the stems to make them more frost hardy. So we tried trimming with six of the next eighteen seedlings. We also stripped lower leaves and attempted to plant another six more deeply. Deeper is not very easy when you have hard rocky ground (thanks Trent). The last six we planted as they were, but they’d had a few weeks of my not very tender care on the verandah with my other seedlings. They all seem to be doing okay, which may be because we’ve had less severe frosts. Next year, I’m hoping we can try more and plant them earlier, hardier and happier, and get some really interesting long term results. 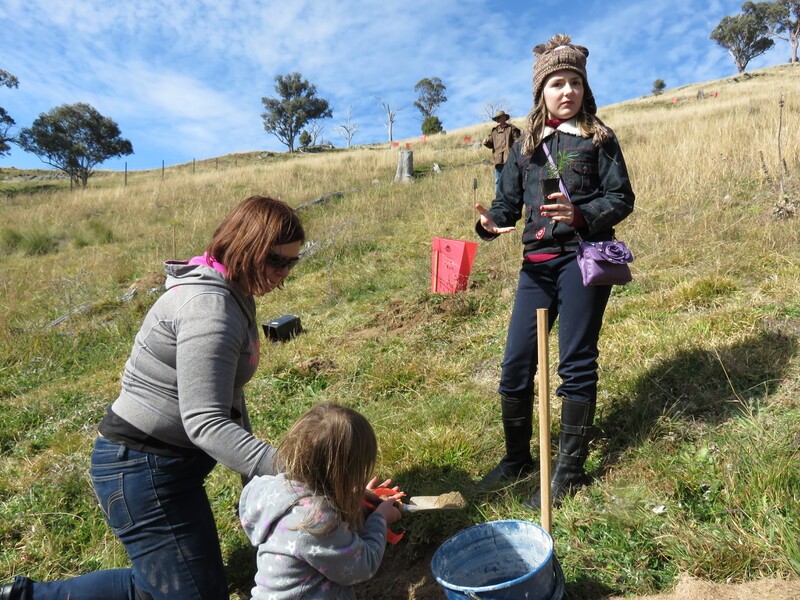 Stay tuned for what we did with the Chief Scientist’s Snow Gums.